We understand that a company’s workforce drives its success, and our upgraded LMS is designed with that in mind. This month’s edition of our Bright Ideas newsletter brings you more ideas to manage learning at all levels of your organization. PCI Compliance is critical to the success of your business. Training on compliance with the Payment Card Industry Data Security Standard (PCI DSS) will protect the credit card information of your customers. In this module, your employees will learn important card security issues, what is sensitive card holder data, and the rules you must follow to prevent credit and debit card data theft. Done and Destroy. The most important guiding principle of PCI compliance is simple: As soon as credit card data is no longer needed, it should be destroyed. Security Rules. Follow these basic rules to keep cardholder data secure. Never copy sensitive cardholder data to any form of electronic media. Never manually copy credit card numbers or information, such as writing them on a scrap of paper, ledger, or hand ticket. Keep cards in sight of the customer at all times during the transaction. If you have to hold on to any credit card data for an approved business purpose, keep that data in a secure, locked environment. If you have physical credit card data that needs to be thrown away, it must be completely unreadable, incinerated, or cross shredded into pieces no greater than 1/4 inch. Never send e-mails containing credit card data. Store management should be immediately involved any time a customer leaves their credit card behind. There’s truth in the Chinese proverb that says, “I hear and I forget, I see and I remember, I do and I understand.” Adult learners remember what they see two times more effectively than what they read. Whether you’re launching a new promotion or certifying employees in new compliance regulations, you need an overall strategy to manage learning, not just a single method to deliver training. People learn in different ways, and therefore you must train in different ways. By definition, blended learning combines more than one method of training into an overall learning management strategy. 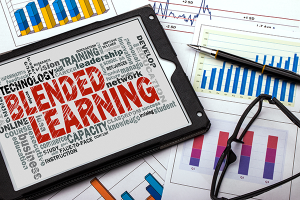 Click here to find out how blending learning works.